Tires underinflated by 10 percent is estimated to decrease tread life by nine to 16 percent. In the days before full-service gas stations went the way of the dodo, in addition to filling ‘er up, the attendant would sometimes check the tire pressure. These days that task, along with actually pumping the fuel, has totally fallen back on the driver, but it’s a job that is easily overlooked. This leaves many people driving around on tires at less than optimal pressure resulting in reduced performance and fuel economy. For the past year, Goodyear has been developing its self-inflating tire technology that’s designed to keep tires inflated at the optimum pressure and the company is now set to debut the technology in Germany. Goodyear’s Air Maintenance Technology (AMT) system automatically keeps tires inflated to the optimum pressure without the need for any external pumps or electronics. 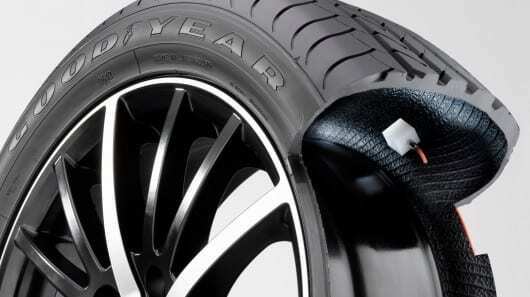 Rather, all the system’s components are contained within the tire itself. The heart of the system is an internal regulator that detects when the air pressure drops below a pre-specified psi and then opens up to allow air from outside the tire into the pumping tube. Air is pushed through this tube to the inlet valve and ultimately into the tire cavity by the deformation of the tire as it rolls over the road. Goodyear is initially aiming its AMT system at commercial vehicle fleet operators, citing 2008 figures from the American Trucking Association that more than half of all truck and trailer breakdowns for such operators involve a tire in some way, making tire-related costs the single largest maintenance item for fleet owners. The simple act of keeping tires properly inflated can cut costs by improving fuel economy and prolonging tread life.